Just this week someone mysteriously left a bag of large plump lemons on the table in my office. Whether a thoughtful gesture or a reminder to rejuvenate this blog, they beckoned with possibility. When I asked my just graduated from high school son what he would like to make of these lemons, he replied wistfully, “You know lemon cake you used to make?” and it was settled. I enjoyed reminiscing with him about how I discovered this classic recipe while he extracted every last drop of juice in the lemons and made the drizzle. I hope you will be able to enjoy a slice with summer berries and share some fond memories over the aroma and deliciousness that is Lemon Drizzle Cake. When I added a slice of Lemon Drizzle Cake to my lunch tray at the V & A Cafe of the Victoria and Albert Museum in London, I wasn’t even that hungry. But, hey, the name of the cake was, well, so darn cute! Besides, I figured, I have this lemon blog which makes me somewhat obligated to sample such aptly named treats for my, uh-hem, readers. For kicks, I googled the cake title when I got back home and was surprised to find that more than being cutely named, Lemon Drizzle Cake is actually a British classic. I researched and reworked the recipe, working primarily off one from BBC Good Food, and have included it here both in standard and metric with the help of this great conversion tool. I have made the recipe several times since and always to rave reviews. Easy, dependable, and delicious–the hallmarks of a classic. American readers will notice two ingredients not often called for in recipes from the states: caster sugar and self-rising flour. Caster sugar is the name of a very fine sugar in Britain, so named because the grains are small enough to fit though a sugar “caster” or sprinkler. It is sold as “superfine” or “baker’s” sugar in the United States. Because of its fineness, it dissolves more quickly than regular white sugar, and so is especially useful in meringues and cold liquids. To make your own, grind granulated sugar for a couple of minutes in a food processor, letting the sugar dust settle before opening. 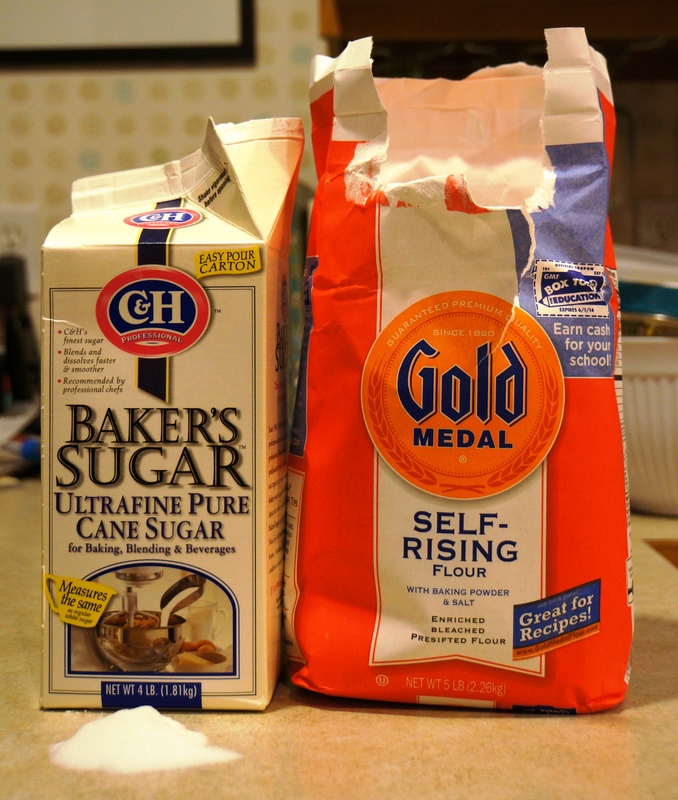 Caster Sugar is sold as Baker’s Sugar in the United States. 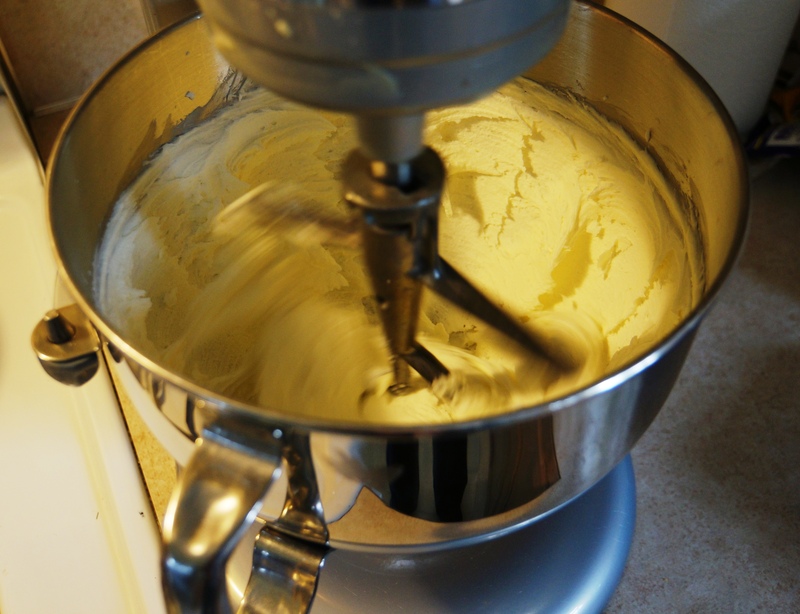 Self-rising flour keeps measuring simple as it already includes the baking powder and salt. Self-rising flour (or “self-raising” as it is called in the UK) is simply flour with baking soda evenly distributed throughout. You can also make this ingredient at home by adding about 1 teaspoon baking powder and a pinch of salt per cup of flour, blending well. Personally, I like the ease of having a bag of self-rising flour on hand–no measuring spoons or extra ingredients to be hampered by, which just adds to the ease of this recipe. Lemon Drizzle Cake is lovely with tea, coffee, or a tall glass of milk. Increase the lemon quotient by adding a dollop of lemon curd atop each slice. For an after dinner dessert to die for, serve with mixed berries, fresh whipped cream and a flute of chilled Lambrusco or champagne. Lemon Drizzle Cake has easily become my favorite London import. I hope it will become your “go to” recipe, too. 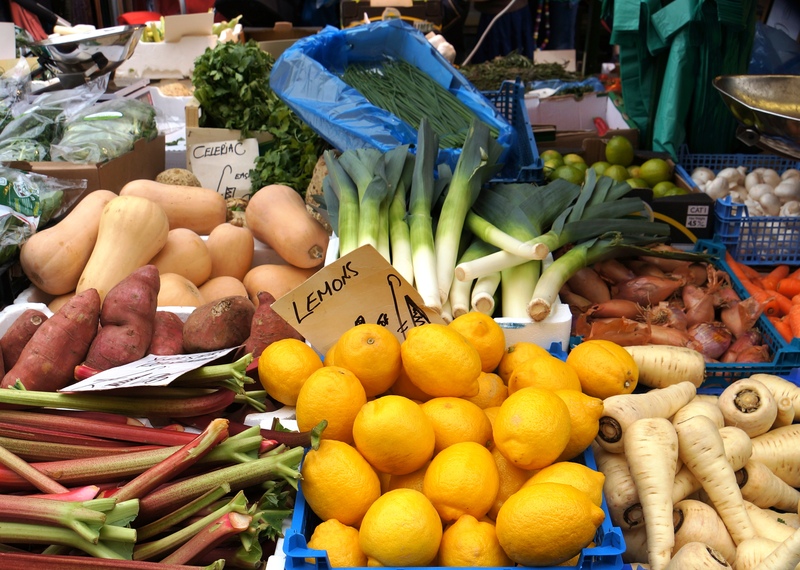 All it takes is butter, sugar, flour, eggs and three to four large lemons! 2/3 c. lemon juice/about 5 oz. 1. Pre-heat oven to 160 C/gas 4 or 325°F. 2. Zest and juice three to four large lemons. 3. For the batter, beat together softened butter and caster sugar until pale and creamy, then add eggs, one at a time, slowly mixing through. Gradually add in the self-rising flour, then add the finely grated lemon zest and mix until well combined. 4. Line two large or three small loaf pans with parchment paper (my favorite new tip), then spoon in the mixture and level top. 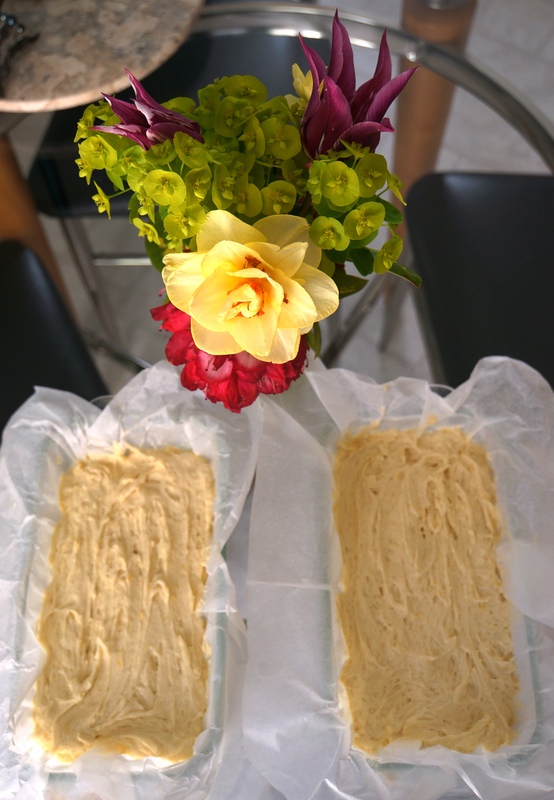 Leave parchment paper handles for easy removal of cakes when done baking. 5. Bake for 50-55 mins until a thin skewer inserted into the centre of the cake comes out clean. 6. While the cake is baking, mix together the lemon juice, zest, and caster sugar for the drizzle. 7. When cake is golden on top, remove from oven and place pans on cooling racks. Make three lengthwise slits about 1/2-1 inch deep on top of cake. Spoon drizzle into slits and then overtop entire cake while still warm. 8. When completely cool, pick up by edges of parchment and remove from pans. Slice and serve. Will keep in an airtight container for three to four days, or freeze for up to one month. 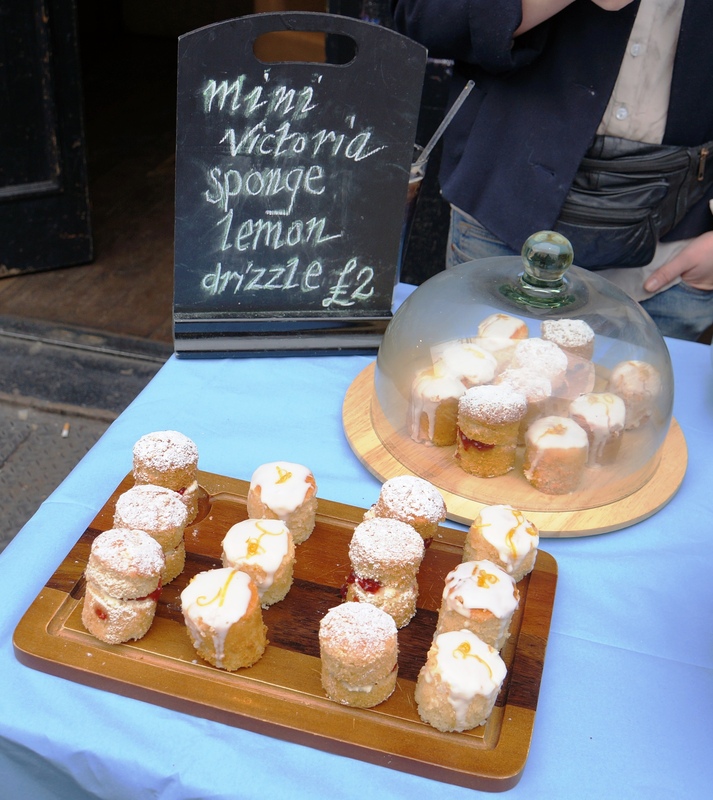 Lemon Drizzle Cake makes a bite-sized appearance, Victorian style, at the Portobello Market in West London’s Notting Hill. 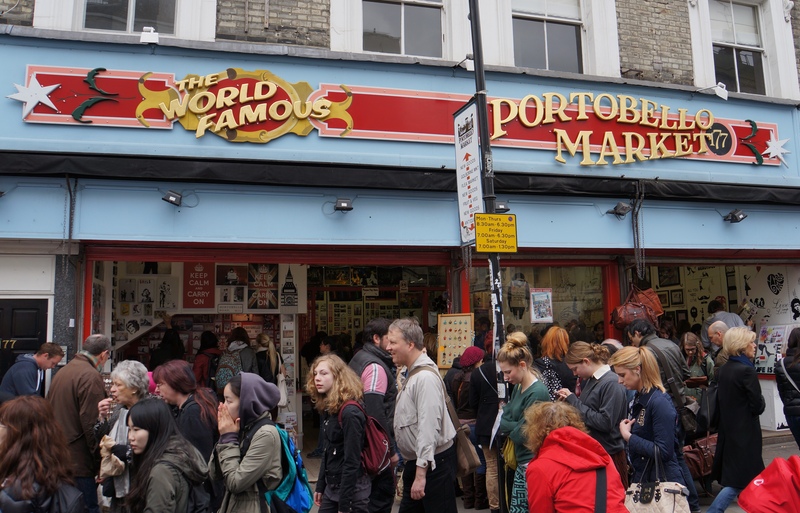 Serious crowds throng the market on Saturday afternoons. 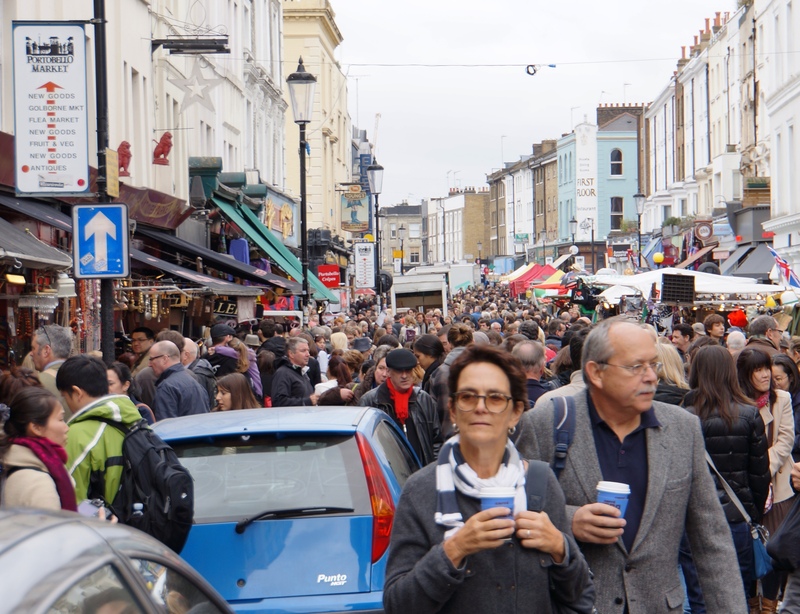 The Elgin Crescent and Talbot Road section of the Portobello Market is where crowds thin out and colorful characters peddle their produce to locals. 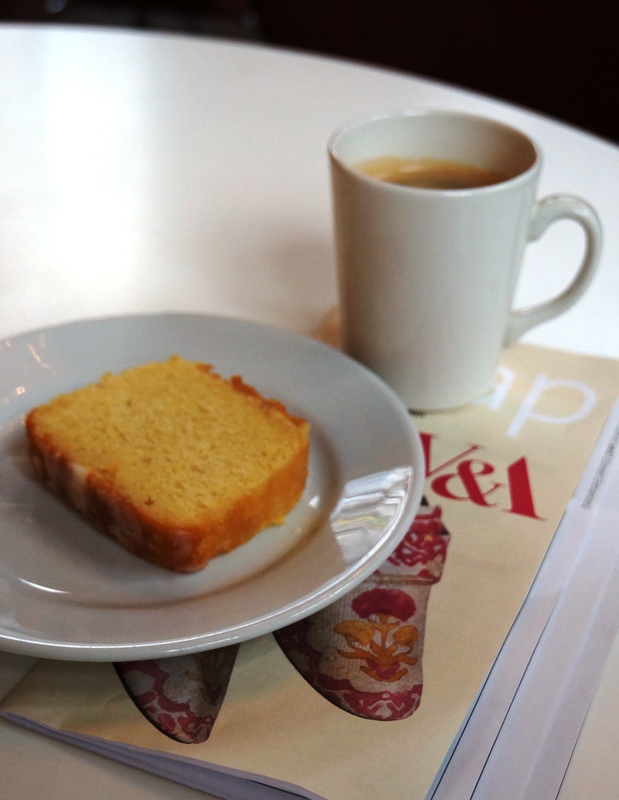 Lemon Drizzle Cake is lovely with tea, coffee, or a tall glass of milk. Increase the lemon quotient by adding a dollop of lemon curd atop each slice. For an after dinner dessert to die for, serve with mixed berries, fresh whipped cream and a flute of chilled Lambrusco or champagne. Lemon Drizzle Cake has easily become my favorite London import. I hope it will become your “go to” recipe, too. I just want to let you know that I am taking a short blogging break as I had Lasik surgery at the end of the week and the eyes tire easily on the computer. That didn’t stop me from making my Mile High Lemon Meringue Pie on Sunday, though. 🙂 This time I used 6 Tbs. each of flour and cornstarch so that the filling would be thick enough to slice at room temperature. The crust is so much more flakier when it doesn’t have to be refrigerated. Yum! While I have several drafts of lemony posts in the queue, including some great products to feature, for now allow me to share an entry written about a weekend trip to Portland, OR in order to give you the scoop on an independent bakery called Cupcake Jones. 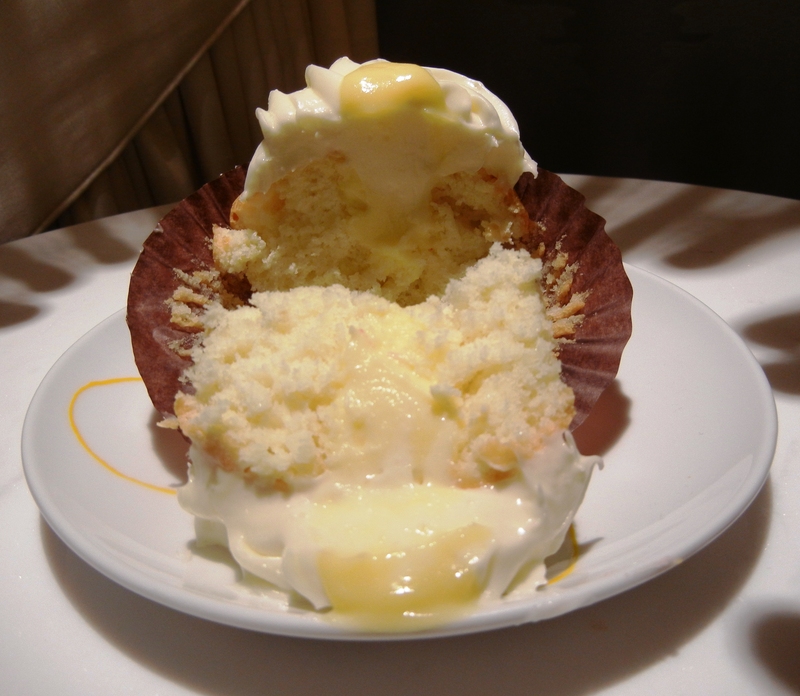 I confess that their Velvet Painting Cupcake is my hands down favorite and one bite makes me swoon, but the “Lemoncello” Cupcake makes the heart-strings sing as well. I could not believe how much it tastes like Lemon Meringue Pie! Be sure to visit Cupcake Jones next time you are in Portland. In the meantime, you can read a bit about the owners, Oregon natives Lisa Watson and Peter Shanky, and view their daily specials and monthly menus to inspire your desire. Anniversaries are supposed to be spent with, not away, from your loved one. But after an anniversary weekend in Portland, Oregon, I guess I can’t complain…too much. It was on this day, so many years ago, that I realized two of my dreams for the future: one, to see Macy Gray in concert and two, to fall in love. It was the first time I saw Macy, and my beau, in person. Neither of us, my beau and I that is, have looked back since. One of the many endearing things about our relationship is that even though I can never remember the date or year we met, although I ask on a nearly monthly basis, he patiently tells me again and again. Thus the “so many years ago” reference above. I know this is the day, though, because I already received a Happy Anniversary email which I was supposed to sing to the tune of The William Tell Overture. I will demand a serenading when we check in this evening by phone. For now I will relish in the recent memory of our weekend, basking in the turquoise decor of The Nines, visiting the Portland Art Museum to view the work of Mark Rothko only to be swept away instead by the haunting genius of John Frame’s The Tale of the Crippled Boy, stumbling upon an open air swing dance exhibition, ogling at the mind-boggling wrap-around line of patrons waiting for their Sunday morning Voodoo donuts, sharing a red ale at The Rogue (where we also picked up a big pink bottle of their Voodoo Bacon Maple Ale) delighting in the decadent offerings of Cupcake Jones, walking and browsing and people watching in the Pearl District, trying on eyeliners and lipsticks at every girls’ candy store, Sephora, and picking out my first pair of non-prescription designer sunglasses in preparation for Lasik surgery. Well, I did the last two and he tried to hide any impatience while offering a best guess when called upon to express an opinion. And today, we are still as happy, even more so, than we were ever so many years ago. “And just how many years ago from today?” I ask again after he serenades me to the tune of The William Tell Overture without any prompting. “How many years ago from today what?” he teases. “You know, for how many years ago from today have we been together?” I inquire sweetly. “Less than ten, more than eight,” he indulges, sighing in what I know is mock exasperation. “Do you still have that concert ticket stub?” I ask, already knowing the answer. Voodoo Doughnut devotees wait in line. Locals and visitors alike can be seen walking throughout town on any given day proudly carrying the signature Pepto-Bismol pink colored box. Maple Bacon Bars anyone? Decadent delicacies from Cupcake Jones, Portland, OR. Back Row: Lemoncello, Chocolate Chip Cookie, and my favorite, Velvet Painting–a red velvet cake with a crunchy outer cake layer, moist inside, vanilla bean pastry cream filling, and soft cream cheese frosting topped with a hand candied rose petal. Front Row: German Chocolate, What’s Up Doc? (carrot cake with candied carrot slice), and Peter’s Chocolate Mint. A stroll through South Park Blocks, Portland, OR, on the way to the Portland Art Museum.